One test. 67 insights into your DNA. CarrierCheck can help you discover how your DNA may affect your future children. Just like traits such as eye color and height, genetic conditions can also run in families. CarrierCheck gives you insight into your carrier status for 67 inherited conditions. While carriers are usually healthy, knowing your status can help you learn more about your family’s genetics and what the risks might be for future generations. Through our partnership with Helix, you will also gain access to Helix’s full range of tests so you can continue your DNA exploration. CarrierCheck is convenient to order and easy to understand. Order CarrierCheck online, and your DNA kit will be shipped directly to you. 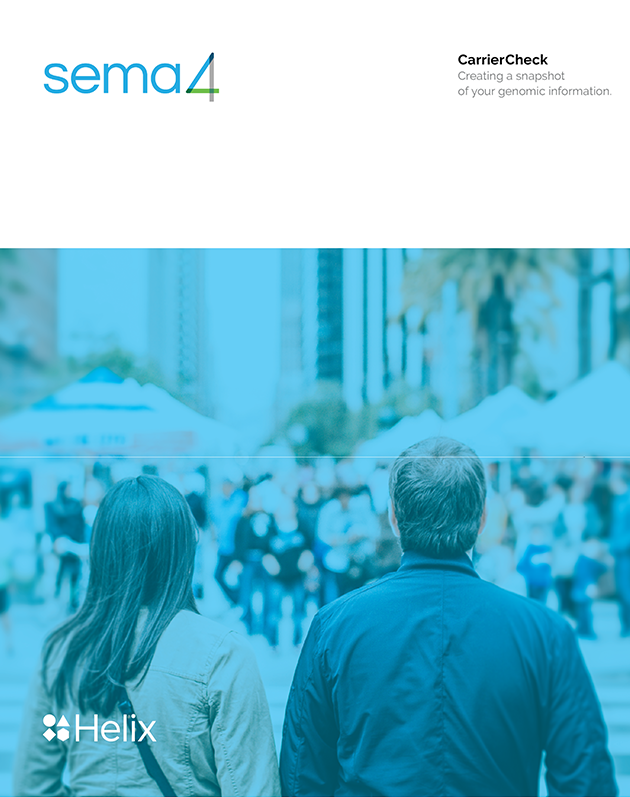 A genetic counseling session and customized test report are also included with every order to help you understand your results. CarrierCheck is purchased through the Helix marketplace. To place your order, you will be leaving the Sema4 website. If you have a personal or family history of certain medical conditions, CarrierCheck may not be right for you. This test is not appropriate for you if you are pregnant or trying to get pregnant. Medical experts, such as the American College of Obstetricians and Gynecologists, recommend a more comprehensive carrier screen that includes conditions like spinal muscular atrophy if you are trying to have a child. Once you place your order, a doctor will review the health information you provide to confirm that CarrierCheck is appropriate for you. If your test request is not approved for any reason, you will not be charged. If this is your first Helix purchase, you will start by placing an order and creating a Helix account. Then, a DNA kit will be sent to your home. Please provide a saliva sample. Next, register your kit through your Helix account. At this time, you’ll receive an email inviting you to create a Sema4 account. Follow the link to create your account and mail your kit back. 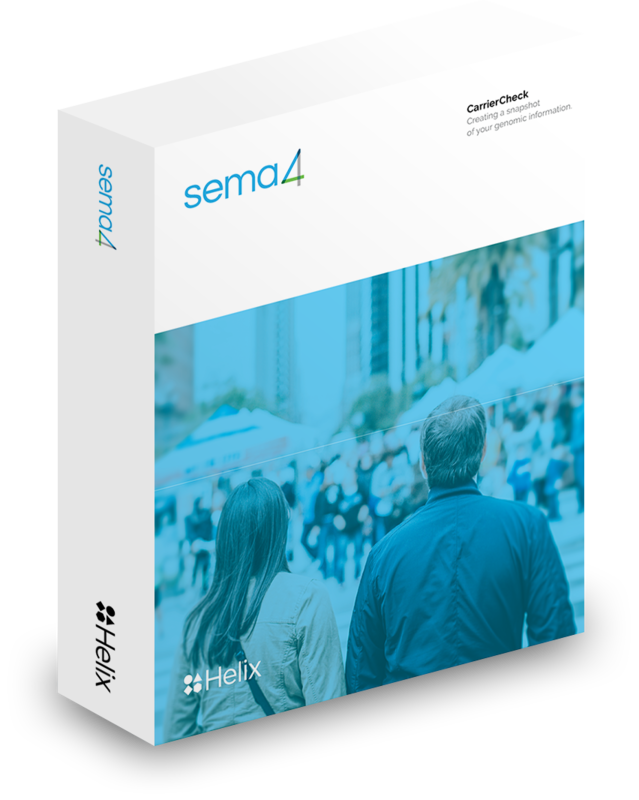 If you have ordered from Helix before, you won’t need to provide a new sample but you will need to create a Sema4 account to access your results. A doctor will review your health history information to confirm that CarrierCheck is appropriate for you. If your test request is not approved for any reason, you will not be charged. Your sample is analyzed. If this is the first product you have ordered from Helix, this will take about 6 to 10 weeks. You can track the status of your test online. Once your results are ready, you will receive an email. Schedule a consultation with a genetic counselor to learn more about your results. View, print, and share your customized results report online. What does CarrierCheck screen for? CarrierCheck analyzes your DNA to see if you are a carrier of gene variants (or changes) associated with 67 inherited conditions. It can help you understand more about how your DNA may affect your future children. Have more questions about CarrierCheck? A negative test result reduces, but doesn’t eliminate, your risk of being a carrier for these genetic conditions. The information provided by CarrierCheck isn’t comprehensive. If you have been diagnosed with a particular medical condition, or if a medical condition runs in your family, speak with a genetic counselor to discuss which genetic test may be most appropriate for you.